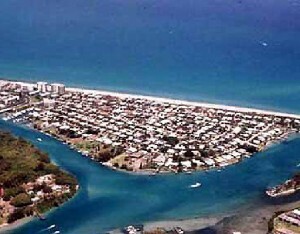 Jupiter Inlet Colony is a small community located at the southern tip of Jupiter Island bordered by the Jupiter Inlet, Intracoastal Waterway and the Atlantic Ocean. Residents, many of whom are on either the ocean or the Inlet, enjoy a peaceful secure community with their own police department. On the south end of Jupiter Island is the small community of Jupiter Inlet Colony , with only about 200 homes and no commercial or public buildings, other than its own police station. One of the most desirable areas of the entire east coast is the area directly north of the Jupiter Inlet, between the Intracoastal waterway, and the Atlantic Ocean. The southern end is made up of single family homes, and is known as Jupiter Inlet Colony.Prices start in the low $100s (condo) and range to the $millions.